Karma is the act, work or deed that affects our future life and also, our life in the next birth. There are three types of Karma : Sanchita, Prarabdha, Aagami. Sanchita Karma is the one you carry from multiple past lives (includes both positive and negative effects; however, negative effects won’t be carried beyond 7 lives while positive effects can be carried till your last life). Prarabdha Karma is mostly carried from immediate past life and can also be a mixture of balance negative karma from few past lives and this has to be forcefully experienced by you in present life. Sanchita Karmas can wait and can be postponed through prayers, meditation, remedies, donations etc but timing and execution of results of Prarabdha Karma cannot be altered. At the most, one can reduce its intensity in this life. Aagami Karma is what you accumulate by your deeds in this life, and will be carried forward for next life and their total becomes sanchita karma for next life. Good actions done with good intent help you create Good Karma. This karmic cycle goes on till balance of karmas becomes ‘Zero‘ and that would be end of your soul’s journey, which leads to salvation or nirvana. 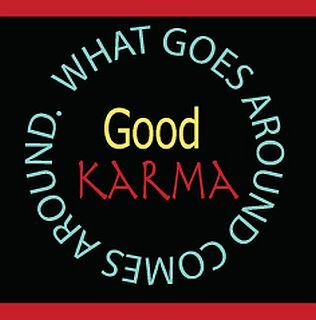 The concept of Karma puts a lot of emphasis, not just on our actions but on our intent as well. The biggest advantage of Kaliyug (present epoch) is that one just has to think of doing a positive deed and he gets partial benefit for his thought. Whereas he will get negative effect not for thinking of a negative deed, but only after actually doing it. This is the secret behind generating more positive karma : Positive Thoughts ! Newton had correctly observed that for every action, there is an equal and opposite reaction. What you do today will impact you in some way tomorrow and only those who choose to live wisely, and with this awareness of how nature works will gain in the end. So, in order to create good karma, should you start donating money? Donate Blood and Organs? Adopt a child? Give up your wealth? These are some thoughts that come to mind and we have seen how the rich love to give back. But, is charity enough or do you need to go beyond all the commonly known actions that people engage in to rinse off their karmic debts? Sure it will do you good when you offer financial help to those in need but don`t do it to free your soul of guilt. Leading a thoughtful life and by being considerate towards one and all, you will find peace sooner than you think. To think all your actions through may not seem feasible but with effort and patience, you will experience change from within and this will help you live a life that`s meaningful. Not all of us are strong enough to lead saintly lives but there are little things that can be done every day to create Good Karma and awaken the spirit that makes you truly human. Change does not happen overnight, it takes time but the sooner you begin this process, the sooner you will find release from the misery caused by negative Karma. Never utter words that you know are going to hurt someone`s feelings. If what you are going to say will not help the person in any way, refrain from saying it. Choose your words carefully and avoid using filthy language or language that one uses to express contempt, anger, rage or other similar emotions. Smile for your family and friends! Spread cheer in their lives with your kind gestures and meaningful actions. Don`t hold yourself back from showing how you care. Let your ego step aside. You will lose nothing in the process. If someone is not skilled, someone has poor writing or reading skills, makes spelling errors, dresses inappropriately, lacks manners – no matter what you think is lacking in another person, you will create nothing other than bad karma for yourself and increase your own suffering by belittling someone. Those who are really secure from within will not indulge in forming poor opinions of others based on what they consider is `right` or `wrong`. If someone is mentally ill, you must find it in yourself to be kinder towards this person rather than ridiculing the illness. Everyone is special in their own unique way and there is no right way to judge someone, so it`s best to focus on yourself and not on others. There is no greater joy than the joy of giving selflessly. Very few have actually lead lives dedicated to selfless actions for the good of others. Helping old people cross the streets, giving up your seat in the bus for someone who may need it more than you, stopping to ask someone if he or she needs any help when you find someone stranded on the street or lost, engaging in conversations with those who seem lonely, complimenting those who seem insecure – it`s the little things you do daily that matter the most. Eventually, you will feel better about all the good that you do for everyone. While a selfish existence is the most convenient way to live, those who believe in the concept of Karma and how it works must find ways to overcome selfishness. Selfishness doesn`t mean you don`t make the most of your life and opportunities that you create for yourself or the advantages you get because of your destiny. Selfishness is when your desires encroach upon the happiness of others or when you don`t stop to think how your actions may be affecting another. It is when you force others to live as per what you think is best. Your selfless acts should bring you happiness and they shouldn`t cause you discomfort or dissatisfaction. It is the intent with which you act that makes all the difference. Increase your capacity for compassion and practice empathy. All these will create positive karma for you and the future effects will be positive in your life or next lives. But as Yudhistir says to king of Virat in Mahabharata : One who donates now has to beg in future. The idea of begging can be anything like asking for money to be invested in your business to actual begging. So, a yogi who attained knowledge of this karmic cycle or patterns will develop passive thinking towards karmic deeds and try to attain nirvana or salvation by balancing his positive and negative karma to ‘ZERO’ and thus attain Moksha. As positive karma can lead positive next life or a stay in heaven, but that is not permanent. Heavens collapse as Yugas and Kalpas change, even Gods and Avatars lose their prominence and can be forgotten. But the supreme power(lord) stays and so does our soul.